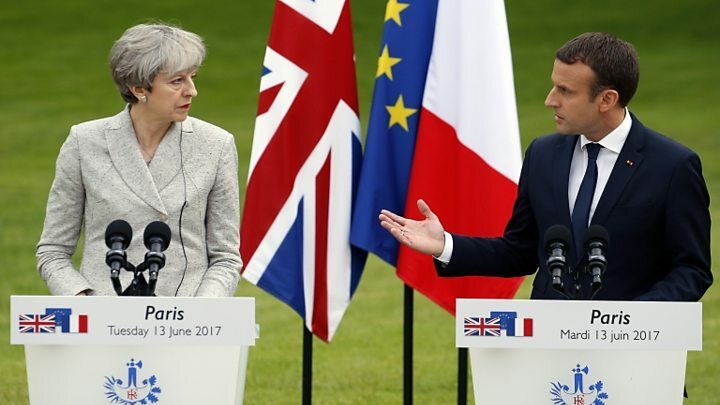 French President Emmanuel Macron says the possibility of the UK remaining in the European Union is an option until Brexit negotiations have concluded. He was speaking at a joint news conference with UK PM Theresa May. But he said he acknowledged and respected that a decision to leave had been taken by the British people. He echoed the words of German Finance Minister Wolfgang Schaeuble, who also said the UK could change its mind about Brexit. "If they want to change their decision, of course they would find open doors, but I think it's not very likely," Mr Schaeuble told Bloomberg Television. Brexit: What are the options? Has the election changed EU views of Brexit? After talks with Mrs May in Paris, Mr Macron told reporters: "Of course the door remains open, always open until the Brexit negotiations come to an end. "That being said, a sovereign decision was taken by the British people and that is to come out of the European Union, and I very much respect the decisions taken by the people, be it by the French people or the British people. "In this case it's not for me to say whether or not this decision should be questioned... but until the negotiations come to an end, of course there is always the possibility to re-open the door. "But let us be clear and organised, and once the negotiations have started we should be well aware that it'll be more difficult to move backwards." Formal talks are due to begin on 19 June, but Mrs May's hopes of going in with a strengthened mandate were dashed after she failed to secure a majority in last week's general election. Downing Street insists it will not change the approach to Brexit it set out last year. The EU's chief Brexit negotiator, Michel Barnier, warned on Tuesday that no progress had been made on the "extraordinarily complex" talks since Mrs May invoked Article 50 in March. He urged the UK to begin talks "very quickly", telling the Financial Times: "I can't negotiate with myself". Under Article 50, the UK is due to leave the EU by the end of March 2019. Leaving with no deal in place could mean trade tariffs between the UK and the EU unless interim arrangements are made. Enthusiastic Remainers have been quick to jump on the election result as their latest opportunity to mould the UK's departure from the EU. The various lobby groups, including former ministers still close to some in government, have been whirring with chatter and tactical planning about how to get their voices heard. There are ideas about commissions or "neddies" - groups of advisers from business and all political parties that met in years gone by. Even senior Tories like the leader of the Scottish Conservatives, one of their few success stories at the moment, told us yesterday "it can't just be a Tory Brexit". On first hearing, that is a staggering thing to hear from Tory lips. But before Remainers get swept up in their moment, and their ambitions swell, it's worth pondering what possibly might be on the table, and what might not, given the usual caveats about the unpredictability of what might come next.